"The gods of Karachi…think that East Bengal contains only milch cows and that the Royal Bengal tiger is dead. Sher-e-Bangla they think is no more. The time is coming when Sher-e-Bangla will roar again,"
"I am the living history of Bengal and East Pakistan of the last sixty years. I am the last survivor of that band of unselfish and courageous Muslims who fought fearlessly against terrific odds…"
In 1939, when he was the Premier of undivided Bengal, we were living quite close to his house. As a young boy, walking by his house I used to notice a small crowd always in front of his spacious house, including some Kabuliwallas. Security was not so tight those days and protocol was low-key. In 1946, I saw him in the Bengal assembly chambers, when my father took me there to watch the proceedings. As a student of class 10, my friends and I went to his house in Park Circus in Calcutta in 1947 to raise funds for a Milad at the school. He had the reputation of giving away to students, widows and shrines money. He was 'the benevolent insolvent.' We found him examining some legal briefs, the great lawyer that he was. He listened to us about the purpose of our visit, opened a rickety old drawer in his desk. With an affectionate grandfatherly smile, out came a ten-taka note, a lot of money those days. In 1951, as University students we went to his house on K.M.Das Lane in Tikatuli for selling tickets to a drama we were staging from the Dhaka University Sanskriti Samsad. Again, it was a rewarding visit. During Hamidul Huq Choudhury's PRODA (Public Representative Office's Disqualification Act) trials in the Dhaka High Court, as a university student I went to attend the proceedings. I believe it was 1950 and the case related to irregularities in the disposal of the Allenbury Drum Factory, located in the road passing by the old Tejgaon airport. Fazlul Huq saheb was defending Choudhury in front of two former-ICS judges, Justices Shahabuddin and Ellis, constituting a special tribunal. He asked several searching questions to Aziz Ahmad, then the Chief Secretary of East Pakistan. During questioning, Aziz Ahmad, also an ex-ICS officer had to admit that he was keeping secret files on the activities of the ministers of the East Pakistan government (all belonging to the then party in power the Muslim League.) He was sending reports to the central government without the knowledge of Nurul Amin, the chief minister of East Pakistan. It was an extraordinary practice, which embarrassed everyone present in the courtroom, including the judges, but the chief secretary was unabashed! The next time I saw Fazlul Huq was in 1953. It was at a lunch in celebration of the wedding of an uncle of mine, Mirza Gholam Hafiz at the house of Justice Ameeruddin Ahmad. Sher-e-Bangla arrived a bit late, and took his seat on the farash under a shamiana, like all of us. He was in a great mood, joking around with the young and the old. People were of course highly respectful to the great man. I saw Huq saheb, known for his great appetite, devour with relish whole a roast chicken. At that time, he was eighty years of age. In 1954, I saw him in the Palton Maidan on a high rostrum with Bhashani and Suhrawardy whom he had joined in a united front against the ruling Muslim League. It was a huge public meeting before the provincial elections of 1954. Maulana Bhashani had just warned that if Fazlul Huq became the chief minister, he should fulfill the election pledges-otherwise people would take him to task. Huq saheb stood up and in front of a huge gathering, put a whip around his neck and said he was prepared to be chastised by the Maulana with that whip. It was a typical example of Fazlul Huq's many ingenious ways of capturing the attention and affection of the masses. Last month, I searched for books on the life and contributions of AKM Fazlul Huq in a number of Dhaka bookshops. Unfortunately, I could not find any. Though I had the benefit of reading about his political exploits in Dhaka and Kolkata newspapers from the forties to the sixties, I wanted to learn more about him. Only one shop in the New Market offered me a book "Understanding the Muslim Mind". It is an account of eight great Muslim leaders of India, which includes Sayyid Ahmed Khan, Jinnah, Abul Kalam Azad and Fazlul Huq. Interestingly, the author is Rajmohan Gandhi, Mahatma Gandhi's grandson. I am giving below Fazlul Huq's life in brief and a few anecdotes about him, gathered from that book and other sources, like the Banglapedia and Wikepedia. Fazlul Huq, a brilliant man, had an illustrious career. He was an important political personality of India, who was popularly known as Sher-e-Bangla. He was a great orator able to speak in many languages, capturing the attention of both the elite and the common man. He was born in Bakerganj in 1873. He graduated with triple honours in Chemistry, Mathematics and Physics in 1894, from the Presidency College Calcutta. He obtained M.A. in Mathematics and B.L. from the Calcutta University. During the launching of the Muslim League in Dhaka in1906, Fazlul Huq was asked to help write the party's constitution. Later the same year he joined the Bengal Civil Service as a Deputy Magistrate, which he resigned after a few years. He started legal practice in Calcutta, and was articled to the eminent educator and jurist, Sir Asutosh Mukherjee. 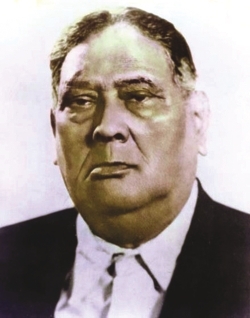 Fazlul Huq was the president of the Muslim League from 1918-21. Later he founded the Krishak Praja Party. He was elected the mayor of Calcutta in 1935 and a member of the Bengal Legislative Assembly in 1937. Fazlul Huq rejoined the Muslim League in 1936 and moved the historic Lahore Resolution in 1940, which demanded creation of Pakistan, a separate Muslim state. He was the Premier of Bengal during 1937-43 and did a lot for Muslim education and relieving the debt-burden of Muslim peasantry. He made primary education in Bengal free and compulsory, from which the backward Muslim community benefited the most. As Premier, he issued orders for reservation of 50 percent appointments for the Muslims and strictly enforced this ratio in the offices of the Government of Bengal. In 1941, at the time of Tagore's death, paying tribute to Tagore in the Bengal assembly floor Huq saheb called himself a proud member of the great Bengali race. He loved Calcutta very much as Rajmohan Gandhi put it "the city had given him glory, adulation and love. It was there that he had studied, roared and reigned." At the time of the partition of India, he sought Calcutta's inclusion in Pakistan, but that was not to be. He came to Dhaka as an 'out- and- out Bengali' and appointed as the Advocate General of East Pakistan, a position from which he resigned in 1953. In 1954, he led the United Front to victory in the Provincial Assembly elections. He became the Chief Minister but his cabinet was dismissed after only two months by the central government. Newspapers had reported that in an emotional speech during a visit to his favourite city of Calcutta, he had mentioned the word independence of East Bengal. Fazlul Huq maintained, to no avail, that he had mentioned autonomy, not independence. Subsequently, he became the Interior Minister of Pakistan and later the Governor of East Pakistan. He died in 1962. Fazlul Huq had innumerable cousins, nephews and nieces for whom he did what he could. There is a story of one of his nephews, a matriculate, who applied for the post of chief inspector of registration, during the premiership of his uncle. But the inspector- general of registration appointed a more qualified candidate. When the Governor, at Huq's request, gave Yusuf a special appointment, a member of the assembly enquired "What are Mr. Yusuf Ali's qualifications?" Huq replied "His qualifications, Sir, is that he is the nephew of the Premier of Bengal". Not known for consistency, he frequently changed his policy, maintaining that 'changes of policy' were not 'deviations from principle.' He said that policies were means to an end. It was like an umbrella-one had to 'hold the umbrella in different directions according to necessity'. Comparing Jinnah and Huq, Rajmohan Gandhi wrote the following: "Jinnah was upright, meticulous and cold. Huq was flexible, casual and warm. Jinnah obeyed his mind, Huq his instincts". In late 1958, he felt like writing his biography. He was then 85 years old and said: "I do not remember very much of what I have been or done." Unfortunately, the friends whom he had made the request "to collect the events of my life" were not able to oblige him on time. This is how Rajmohan Gandhi concluded his account of Fazlul Huq: "He who in 1943 had wanted to see Nazimuddin and Suhrawardy bite the dust now shares the same stretch of earth with them. All three are buried, side by side, in the grounds of the Dhaka High Court. For a while, the two of them were called Prime Minister of Pakistan. Fazlul Huq was not. But only he was spoken of as the Royal Bengal Tiger." Azizul Jalil writes from Washington.